Have you ever dreamed of becoming the next Alan Moore, Frank Miller or Will Eisner? If you’re like, me I’m sure you have. And you probably also thought that making graphic novels, or comic books, is a slow and difficult task that you won’t be able to do alone. Especially if you can’t draw. You have to find someone who will illustrate it (and that sometimes includes someone else who will color and letter it), you will need an editor, and most important, a publisher. It’s a lot of work, but you can’t take care of any of those things if you can’t write a proper comic book script. So, first things first: in this post, I’ll cover everything related to the writing of a comic book script. 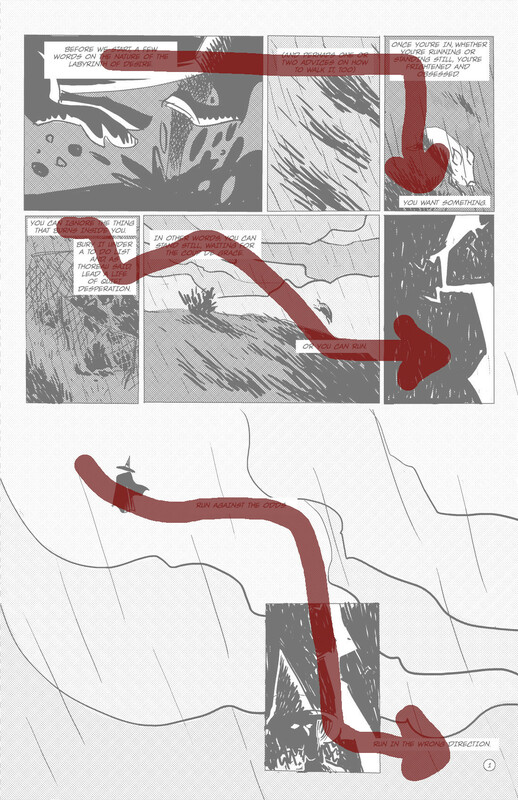 I hope I can show you a clear, easy to follow structure you can use if you never wrote a graphic novel script before. I can't teach you how to get rich and famous with your writing because I'm neither of those things, but I've been making graphic novels and webcomics since 2010 and I can tell you what I've learned in the process. In my opinion, to be a good writer of graphic novels or anything else, you need talent and imagination. I think it was Vladimir Nabokov who said that, but I can't find the quote. Just remember: talent and imagination. Then there's your imagination, which is basically your capacity of seeing things in your mind before they exist in the real world. I guess this definition applies to everything, not just to art. I'll tell you how to exercise this muscle, but I'll be a bit less specific here, and a bit more metaphysical. Okay, let's get to the first part. The first thing that I learned is that everything begins with an idea. Or, better yet, a handful of ideas. You can’t make a good story with just one idea. I don’t think ideas or story ideas are the most important part of a story, but they are what a reader looks at the most. I tend to have a few ideas every day. I follow Stephen King’s advice: I don’t take notes. That way, the best ideas (or at least the ones I consider the best) are the ones that survive in the jungle of my mind as time passes. Then, when I have an idea that I think is good enough for a story, what I do is resist the temptation to write it. Why? Because a single idea usually won’t take you to a complex story. In today’s world, you need more than just one idea, also because all single ideas have been taken, and there’s only so many ways of telling a story. So I wait until I have another “good idea”. One thing about taking notes: if you think you don't have many good ideas or don't have ideas very often, then write them down as they come up, at least until you get better at having ideas (yes, it's a skill that improves with practice). But why take notes when you can borrow ideas from the big names? Ideas are not intellectual property unless they're too specific. For example, the guy dies and then his ghost shows up to tell his son that his own brother killed him to marry his wife. Who do you think is going to wake up from his grave to sue you? Another one, a lot less complicated: a magical school. Do you think T.H. White or Ursula Le Guin are going to say anything if you set a story in a magical school? Actually, Ursula Le Guin did say something about plagiarism in this article. You should read it, if only to know the difference between borrowing a broad idea and taking a concept someone else developed and making it look as your own. If you're going to borrow something from a friend, don't forget to say thank you. Let's suppose now you have two good ideas. For example, a vampire family drama that takes place in a ghost circus. So now let’s get to the keyword, right? Well, maybe you could. It’s what most writers do and you will probably do well, but perhaps you could keep waiting for two or three more ideas. I don't think you'll necessarily come up with a better story, but I guess you'll have more fun. You start with two oranges and try to keep them in the air, and as you get better, you can add more oranges. And if you think you can’t do it, remember we’re talking about imaginary oranges here. Anyone can do it. You just need practice. Now that you have three or four ideas and you have decided how they play with each other, you can make an outline of the story. It doesn't have to be a long one. One page should do for a one hundred page graphic novel. Just write down how the story begins, what happens and how it ends. Many writers don't write down the plot before they start writing. They have their ideas but prefer to let their characters decide where the story goes. It's a perfectly valid option, but if you're afraid to get lost in your own story (like I am), it's better to write down the plot before you start writing the script. I always wrote the plot for my stories, except when I did my webcomic Silver Nights. There I had a very vague idea of where I was going, but I liked so much my main characters that I let them take charge of the story. The result was good (in my opinion) but there were some parts that lacked tension, a rather slow beginning that didn't quite fit the rest of the story's pace, and some minor plot holes. You can fix all those problems with a second draft, but that's nearly impossible in a webcomic (I published a new page every Tuesday for six years, so every mistake would be seen by my readers before I saw them myself). I would've avoided most of those problems by plotting the whole story before I started drawing. If you're going to make a graphic novel I think it's not essential to plot before you start, as long as you make a second draft of the script. But if you're going to publish the work as a webcomic, my advice is to write the plot. So how does a plot outline look like? It's just a few paragraphs describing what happens in your story. Just tell yourself what happens, and don't waste your time in the details. Not even in the character's names. Write it fast. Don't waste more than half an hour writing. Don't worry, you can correct it as much as you like later. Only three things must be clear in your plot outline: the intro (where you introduce your characters and the conflict), the confrontation (where most of the action takes place) and the resolution. I'm not going to get into much detail here because I never used this structure consciously, so there's not much I can tell you about it, and I don't think you have to do it either. You do have to know what a plot structure is, though. This is the best article I could find on the matter. It's not too long and it has good examples of famous movies. There's a lot of ground to cover here. If you don't understand how to tell a story through images, there's no way you will create a good comic, no matter how well you draw or how well you write, or how imaginative your stories are. But it's not a hard thing to learn. In fact, if you read comics or graphic novels regularly, you already know how this works. When we read comic books, we read them the same way we would read a text without images: from left to right and from top to bottom. That's why, when we see a comic strip, even if it doesn't have words, we don't have to ask ourselves which panel goes first. See? From left to right and from top to bottom. The eye constantly jumps from caption to caption and from caption to the images. That's why you get the sensation of reading and looking at the illustrations at the same time. Another important thing is to let the story be told through the images. When you draw a page, removed all the text and ask yourself if you could understand what happens. Just as in a good movie, the images tell the story. Here I'd like to recommend you François Truffaut's Hitchcock. This book is a record of a series of conversations between Truffaut and Alfred Hitchcock, where the latter explains how he made his movies. Hitchcock's movies are very visual, so a great way to study storytelling is to watch at least three or four of his movies with this book in your hands. You'll learn a lot, I promise. Sometimes I read a comic and I see a handful of pages with only two or three panels where nothing happens. There's nothing at the end of the page that makes you read the next one, and that's a mistake. The story should always be moving forward, or else it will lose rhythm. I always ask myself "what happens in this page?" before I start drawing. And that "something" must be something you can describe in a sentence. For example: Hammett's girlfriend gets out of Esther's house, mounts her bike and leaves. This is a simple action that can be told with images, so it's good for a comic book page. In the context of a story, it also leaves the reader with a few questions, like: what was she doing in Esther's house? and: where is she going now? Always give the reader a bit less information than you feel the reader needs. Jorge Luis Borges once suggested that one should tell a story as if one didn't know quite well what happened. Many, many times I've finished a page and thought I failed at providing the reader all the information the reader needed (for example, why a character does what she does in that page), and later found that the page actually made me, the author, want to keep reading. If it works for the author, I suppose it works for a reader who doesn't know what happens next. Also, when you do answer one of the reader's questions, make him ask himself something else. You should only answer the story's big questions at the end. As a rule of thumb, I'd say explain less and make the reader feel more. But know where you're going. Always know where you're going, because if you don't, it will show. I left dialogue for last because, frankly, I don't think is very important. It becomes important only when you can't tell the story with images, and there are times when no matter how good you are, you won't be able to communicate complex information with a sequence of images. But most of the times the dialogue is secondary, or at least, in a good comic, it should be secondary. It should be like the background music of your story. So if you're not going to draw your graphic novel or comic yourself, you should be very careful when writing your dialogues and captions. You want the artist to have plenty of space to tell the story and show off. Keep in mind that the main thing people will consider before they decide to buy your work is the quality of the art. Yes, I agree with you, the writing is as important as the art (if not more), but most readers don't agree with us. Alan Moore suggests 210 words per page. Divide that into the number of panels you have and you get, for example, 23 words in a nine-panel page, and 70 words in a three-panel page. This way you'll leave the artist plenty of space to make his magic. However, in a panel with two characters talking to each other, it's not a good idea to have more than three-word balloons, no matter how big the page is. There are exceptions, but if you write more than three dialogues the panel becomes a mess. One last thing: the artist will draw the character who speaks first at the left side of the panel, to make it readable. Keep this in mind when describing the scene. It doesn't matter if you can't draw, if you have a scene with many characters, draw for yourself the panel and then draw circles inside the panel, with the names of each character inside. Always the first to speak goes at the left, and the last one goes at the right. 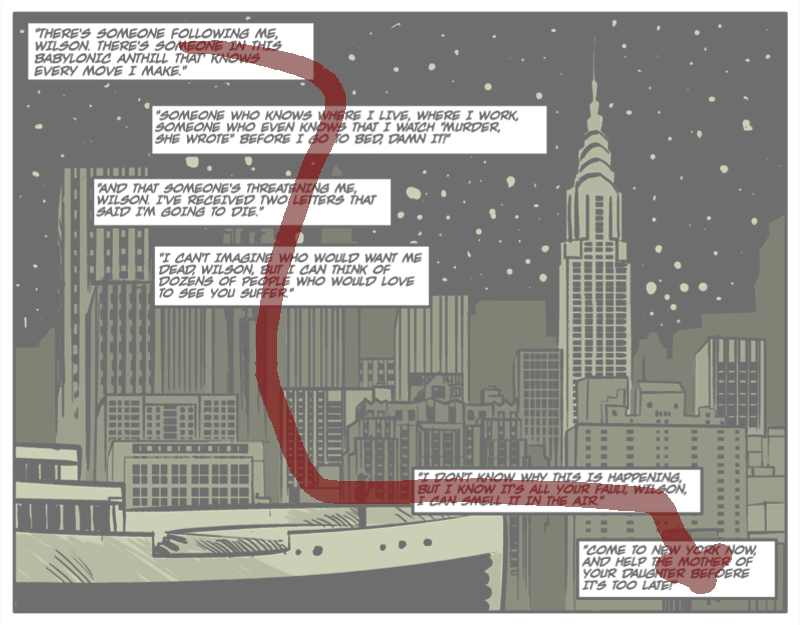 Can a writer without imagination learn how to write a comic book? In my opinion, it happens all the time. I see writers that cannot come up with an original idea to save their lives make very engaging and well-written books because they have a very good technique. A refined set of skills alone can make a good story. But if you aim to make a masterpiece, I think you need something else. Think of V for Vendetta, The Sandman or whatever you think are the best works in the medium. 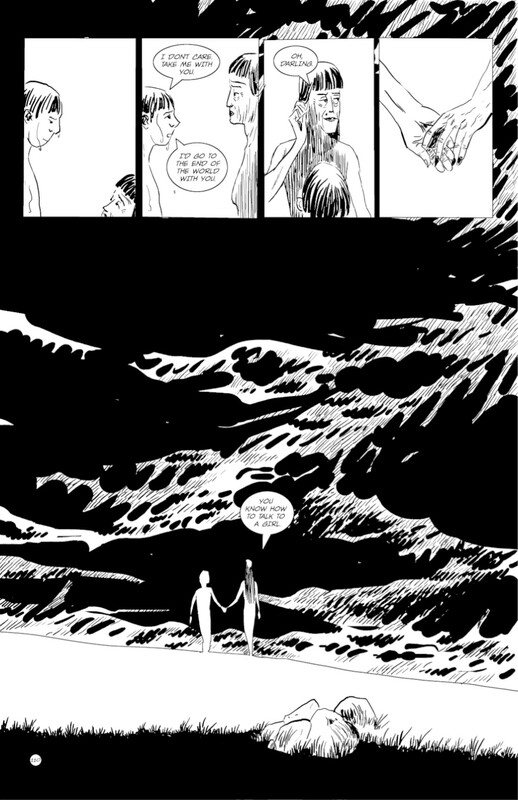 One thing they have in common is that, as you get into the story you begin to see their authors' silhouettes between the panels. You get a glimpse of their personality, their tastes, and beyond that, you see an author's view of life. Now, I remember some comics in which I felt I could read the author's mind, and I didn't like what I read. Perhaps you can remember having had the same experience. I'm not going to name names, but I clearly remember thinking this or that guy's empty, he's just a plot machine, there's nothing behind it. This may be too personal, but I think you need to have a profound view of life. You need to at least be curious about what life and death and love are, Reading philosophy certainly won't hurt, but if you think that's too boring or heavy, try reading some of the classics: Shakespeare, Goethe, Dickens, Tolstoi... Making graphic novels, or comics, is not an excuse for being a brute whose only influences are video games and Netflix. Initially, when someone picks your graphic novel, if you’re still an unknown author, they’re going to be grabbed mostly by the art. Then, they want a fulfilling, exciting story with an amazing ending. That’s what people want when they read a story. But there’s something more. They will be coming back if you give them powerful emotions, and they also will come back if they feel they got to know you. You see, when you read Alan Moore or Neil Gaiman, you’re reading the work of someone who has a deep understanding of life. If your sense of life is profound, if you have a very personal idea of what life is, what death or love is, then it will show up in your writing. You don’t need to be explicit about it. In fact, I suggest you’re not explicit about it, but what do I know. At some point, we all ask ourselves what life is, or if it has a meaning. We want to have a vision of the world that makes sense. It’s not something most of us actively search for when we look for a graphic novel to read, but I think that deep inside, we want to see it. I think you can be a successful author even if all you’re concerned about is the story, the tension you create and how you will solve the conflict. You don’t really need to have a philosophic or artistic view of life to be successful, or even to be happy. But I swear you need it to truly appreciate the wonders and the horrors of the world. If you don’t have it, you’re missing the spice of life. I think the main reason people read is to entertain themselves, but the main reason good literature exists is to make us see life through a different lens. You have to know the basics of structure, storytelling, plot and conflict to make a good graphic novel, but you also need to cultivate yourself as a human being in order to reach other people in a profound way, in a way that you will be giving them something unique. Gabriel García Márquez said he wrote to make his friends love him. That’s the best reason I’ve heard in my whole life for being a writer. If you show people something about themselves they had not seen they will be interested in you, and if you make them see the beauty and the wonders of life and of themselves, they will love you. I feel I know my favorite authors, and I love them. So you must dominate the technique. It’s the set of tools that will take you wherever you want to go. But you also must have imagination, because until you’ve finished your story, those places don’t exist, and you will have to create them in your mind. So don’t waste your time trying to develop a style. Learn the technique of comic storytelling and feed your soul and your mind. You can’t help having an attractive style if you have a good technique and you are a restless spirit concerned with the wonders and horrors of life. It begins with your family, but soon it comes around to your soul"
I don't know why this came to my mind. It certainly isn't an answer to anything. It's not a rational explanation of anything. I'm just sharing this with you to show you that your way of seeing life is something that goes with you wherever you go. Something that's part of you whether you're writing or not. Now go write something wonderful.